Nigeria's interim coach Samson Siasia has given up in his bid to lure keeper Vincent Enyeama and Emmanuel Emenike back from international retirement. Both players quit the Super Eagles last October after falling out with former coach Sunday Oliseh. When Oliseh resigned on Friday Siasia asked the duo to reconsider but they have rejected the idea of a return. "You can't force them to rescind their decision and we have to respect that." Siasia told BBC Sport. "I felt they left under a cloudy circumstance. It was only an opportunity for them to reconsider their stance but it appears they've both decided to stick by their retirement. "Nigeria is blessed with talented footballers and we need to work with those players. We have to live away from the past and focus on a promising future." Goalkeeper Enyeama retired from international football in October last year when the captaincy was taken away from him by Oliseh. "I don't want to talk about this issue again. I think my earlier decision [to retire] stands," Enyeama told Lagos-based radio station Brila FM. Striker Emenike followed Enyeama's lead and quit the Super Eagles a few days later. Siasia and his assistants Salisu Yusuf and Emmanuel Amunike are expected to finalise and name the country's squad for the game against the seven-time African champions this week. 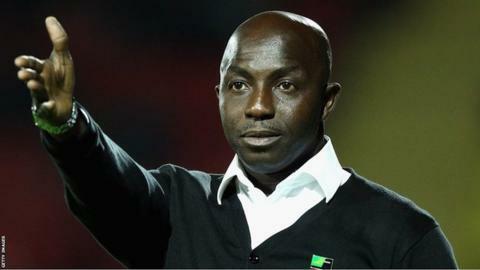 Siasia refuses to confirm whether China-based Obafemi Martins, and premier league duo Victor Moses and John Mikel Obi still have a Super Eagles future. "We can't rule out anyone at the moment. The games against Egypt are crucial matches and we are keeping our focus. We need the support of everyone to succeed. "This is a big task for us and we want to give our best like those players who are prepared to give 120 percent on the field for their country."